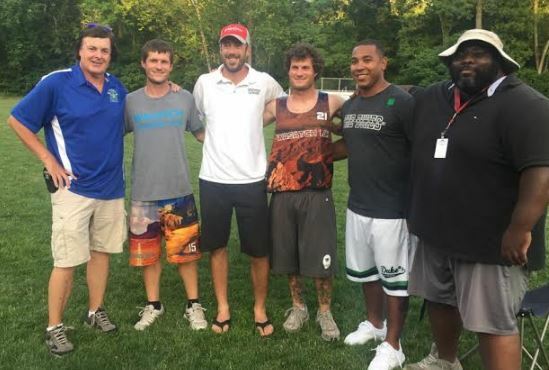 PHILADELPHIA – It was just a scrimmage but on Thursday night the Wasatch Lacrosse Club made a monumental triumph for a small Utah-based club program trying to build against top competition on the East Coast. Chestnut Hill College over a Duke’s Lacrosse Club that featured members from several Duke’s Programs teams. There was no scoreboard and most players were not aware of the score; only that Wasatch has made great strides in its fourth year of playing exhibitions with Dukes, considered among the elite club programs in the nation. The game is part of a goodwill program developed by Duke’s head coach Ebe Helm to help foster growth for the Wasatch program. One Wasatch founder and General Manager is Adam Eddinger, the assistant coach at Chestnut Hill. Wasatch’s other founders and coaches, Danny and Ricky Larkin, played with Eddinger at DeSales University (PA). “I came into this thinking all East Coast kids were like Gods and that we’d get smoked,” said Wasatch 2017 attackman Lincoln Robbins (Jordan High), who had four goals and three assists Thursday. “They are high school kids, too and they have nerves. It shows the West Coast can compete and that we’re coming. Wasatch arrived Tuesday and visited Villanova, Eastern and DeSales universities to get a taste of East Coast college campuses. On Wednesday Wasatch handled HEADstrong’s new Lehigh Valley club team in another scrimmage. “It was nice to compare our talent against the talent back here and to get to visit colleges and see how they work was great,” said Sutton Caplan, a 2018 MF/FOGO from Logan. “I think we compare pretty well. It was a good matchup here today and it was pretty even. It proves we have talent, too and we can compete just the same. Noah Lund, a 2017 attackman from Brighton who had three goals Thursday, was one of a few Wasatch players that came to Philly/NJ year when Wasatch made the finals of the 2016 division (rising seniors) at Tri-State. He said his program has clearly improved. Wasatch goalie Kory Hoffman (Fremont, 2017) also believes his team has built on its confidence. Danny Larkin said Wasatch held its own at Vail recently where his club competed well in the U-19 Division (with many 2016 players) and held its own against New England power Laxachusetts. He said that this performance, even in a scrimmage, was a key step for his team. “This is a huge win for our program,” he said. “To compete with and beat a team with the Duke’s name pushes the sport out West and shows we are getting to that level.